How Does Earth Conductivity Affect the “Takeoff Angle” of a Vertical Monopole? A common belief is that Earth conductivity mostly affects the "takeoff angle" of a vertical monopole. 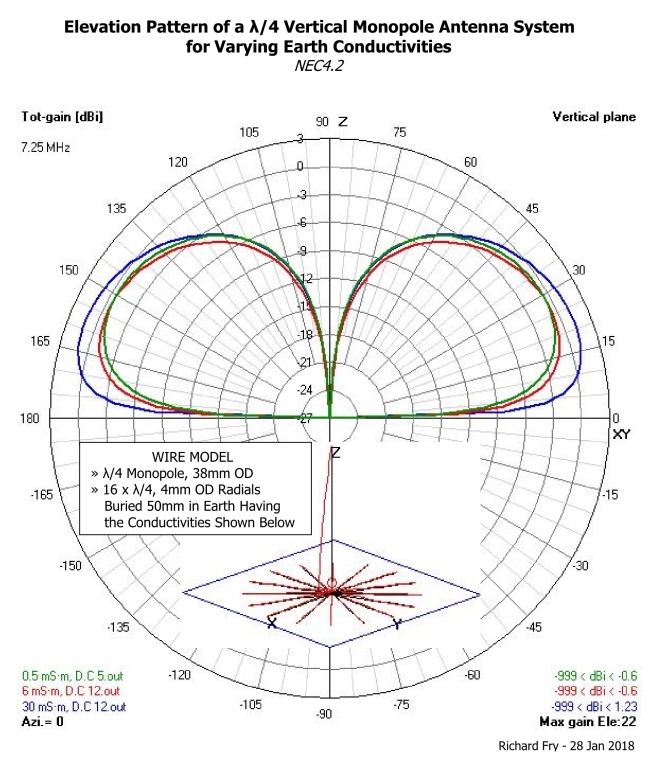 However the NEC4.2 study below shows that the shape of the radiation patterns is quite similar when the same monopole system is installed at sites where Earth conductivity differs through the range from poor to excellent. The biggest effect when going from poor to excellent Earth conductivity (other things equal) is due to the reduced loss of the antenna system path to r-f ground (Earth), when the radial wires are buried in Earth having greater conductivities. It is mostly this reduced loss that is responsible for those greater low-angle fields — not to a lower takeoff angle. In this study there is approximately 1.8dB more power radiated in the elevation angle of maximum directivity for 30 mS/m Earth than for 0.5 mS/m Earth. Not the answer you're looking for? Browse other questions tagged vertical-antenna or ask your own question. How low can a vertical dipole be mounted? Does antenna width/shape affect resonant frequency like length does? How does a multi-element vertical work? What is the attraction of vertical antennas for HF? Can a vertical antenna be used for NVIS? How Does the Performance of Elevated Radials Differ from That of Buried Radials? How Does the Low-Angle Radiation of a Horizontal Dipole Compare to That of a Vertical Monopole?